« Another Awesome Off-Water Morning! I was so happy to send a note to Stan this morning saying “rain drops!” Looks like it is going to cool us down a little over the next few days….at least into early next week. Showers forecast for this morning and again this evening. Then, mid to upper 80s through Monday and very little chances for moisture. Great! Generation schedule has been 50 mwh until about 10:00 a.m. then ramp up to two and finally three units by noon. Once that third unit comes on, fishing really goes south. Stan on the water last Sunday with Brian, from Texas. Pretty good 1/2 day for him on big ruby, ruby 2, lightning bug and tiger tail. Tuesday, Anthony and his son, Carson spent half a day on the water with Stan. They too were from Texas. Best pattern for them was the tiger tail. James and Dana had a group of guys from Oklahoma on the water. Dana took Ted and Joe and they were catching on the Cerise San Juan worm, ruby 2 and stripping the tiger tail. James guys, Jeff and Wade, floated the ruby 2 under the big ruby. Ed and his wife Jean, spent yesterday morning on the water with Stan. Fished good early on then slowed down as it got hotter and the water came up. Another day of the ruby 2 under the big ruby. This was Jean’s first experience with a fly rod. Gina had Wednesday Jim and his boss, Tom out for the morning. Same scenario for them. Fished better early, then slowed down as the day went on. Big ruby, lightning bug and egg pattern. 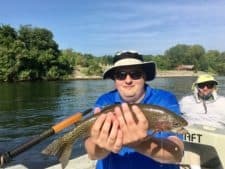 This entry was posted on Thursday, July 27th, 2017 at 8:57 am	and is filed under Fishing Reports. You can follow any responses to this entry through the RSS 2.0 feed. You can leave a response, or trackback from your own site.